Activision and Brutal Legend developer Double Fine Productions have reached a settlement over the release of the video game, wrapping up months of totally lame litigation and all but ensuring the game's safe release this fall. According to a report from the Associated Press on the matter, Activision's legal team informed a Los Angeles Superior Court of the settlement, but have not yet disclosed details on the agreement. A hearing was scheduled today, following a delayed ruling from the court. Activision filed suit against Double Fine in June, claiming still existing rights to the game, despite EA's investment in the action adventure game. 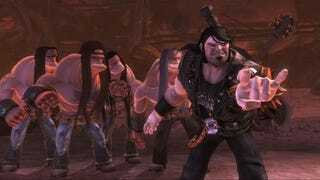 Double Fine later countersued, claiming that Activision wanted to kill Brutal Legend to protect its Guitar Hero franchise.